To familiarize Microsoft Word you need to know the basic parts and controls when you open the program. 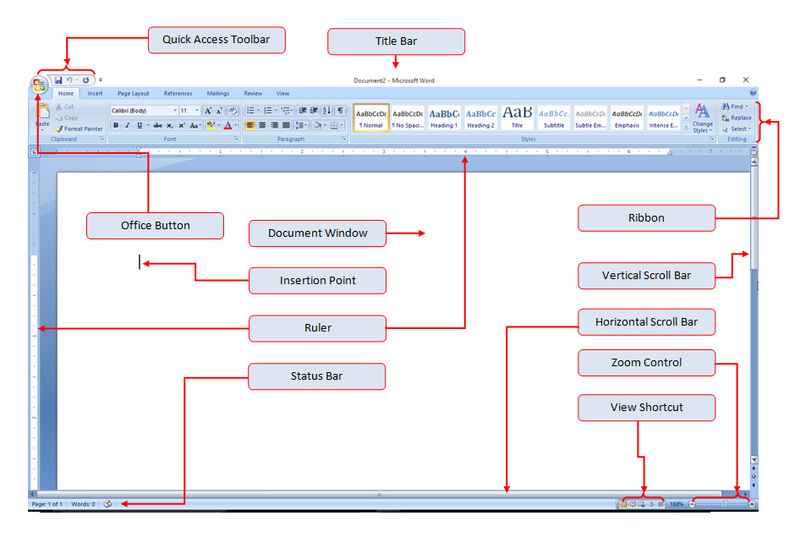 We labeled every part of the interface of Microsoft word 2007 and 2010 to make it easy for you to understand. Below are the two interfaces of Microsoft Word, you will notice that they are almost identical. This is the MS Word 2007 interface. Click to the image to enlarge. And this is the Microsoft Word 2010. Below are the meaning of every part to explain their uses when creating documents. Quick Access Toolbar – Collection of buttons that provide one click access to commonly used commands such as Save, Undo or Redo. You can also customize this according to your preference. Title Bar – A bar the display the name of active document. Horizontal Scroll Bar – Scroll bar to use when you want to scroll horizontally through the document window. Zoom Control – Used for magnifying and shrinking of the active document. View Shortcut – Buttons used to change how the worksheet content is displayed. Print Layout, Full Screen Reading, Web Layout, Outline or Draft. Status Bar – It displays information about your document, such as what page you are currently viewing and how many words are in your document, etc. Ruler – It used to set the alignment and margins of the elements in the documents. Insertion Point – It is the blinking vertical line in your document. It indicates where you can enter text on the page. You can use the insertion point in a variety of ways: Blank document: When a new blank document opens, the insertion point is located in the top-left corner of the page. Document Window – The white space where you can type or attached all the data you need in the document. 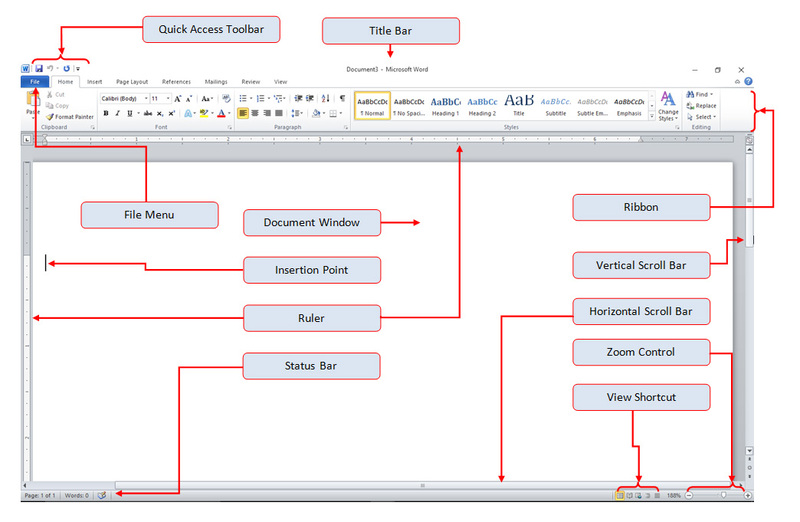 Office Button/File Menu – Office button in MS Word 2007 and File Tab for MS Word 2010 or higher version. It provides access to document level features and program settings.